Guilt Free Snack! 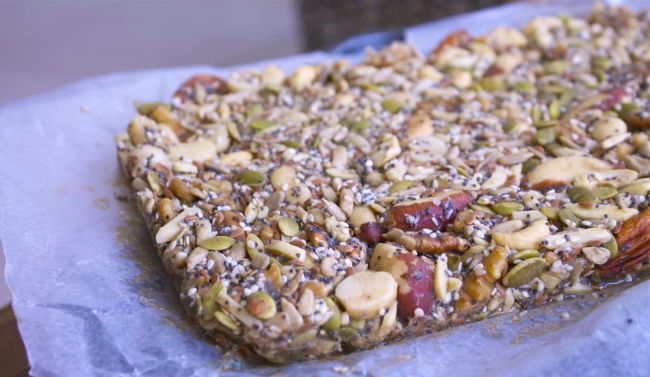 Yep, this amazing tahini slice bar (which is vegan, dairy free and gluten free) is just one of the many delicious snacks being supplied by Karly Kallis. This is an easy and quick recipe, loaded with good healthy fats and carries with it amazing flavors. Adults and kids are raving about these. I took this very recipe and opted to make them into various ball sizes (as well), so I could store them in mason jars to be able to grab a few on the way out the door before my hikes. The recipe works beautifully either as a bar or in ball shapes. To be honest, they are truly a work of art as a bar – as Karly supplies here. Keep in mind that these are best kept refrigerated due to the melting point. I prefer a harder bar so I kept mine cold. Please read my wonderful in-depth interview with Karly, her approach to health and fitness and why she is helping so many others, including why she has chosen the diet path she has. I always say Paleo is only a base to start from and is a terrific template. Karly found what works for her and reveals why she felt she needed to make a change. You can buy or WIN her eBook, Guilt Free Snacks right now! And for more guilt free snacks, try my Paleo Berry Cashew Cream Parfait or Different Paleo Sweet Potato Fries. This is a killer guilt-free snack. You can enjoy these as bars or in ball shapes. Either way works! Perfect for a healthy on-the-go snack for travel or hiking - both kids and adults LOVE these. Heat your sweetener of choice, tahini and coconut oil together in a pan and set aside. Mix your nuts and seeds together, adding them to the heated honey, tahini and coconut oil. Spread onto a brownie tray and refrigerate for 1 hour before consuming. These can be made into any shape you wish. I made them into ball shapes. These are best kept refrigerated due to the melting point. I prefer a harder bar so I kept mine cold.